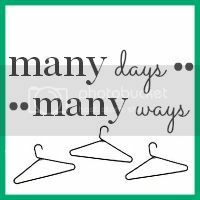 I discovered Goodwillista's blog when she did her first "Many days, many ways" linkup back in February. I remember feeling said that I couldn't join in because my blog was so new. But here it is April and despite my pledge to try to wear all of my closet and not rely too heavily on a few key items ... yeah. Here I am with a "many days, many ways" post so I can join in her April linkup! I love clothes that give me a waist, and this cardigan does a great job of that. The dolman sleeves gathered into that wide, high waistband emphasizes the narrowest part of my body (I feel like I'm channeling Stacy & Clinton), which is always a good thing for me. Plus, it gives me a deep V neckline, which is also a look I like for my shape. The sleeves aren't tight, thus avoiding the dreaded Sausage Arm (this is a problem I have with many sweaters) and making it super comfy to wear, and the waistband actually fits my waist properly without cinching it in uncomfortably. It has a retro vibe without being fussy. Don't get me wrong, I looove me some vintage cardigans. But I'm also cheap and lazy (seriously, that may end up on my tombstone), which means I usually can't be bothered to a) pay for dry cleaning or b) hand-wash sweaters. So wash and wear is my best friend. But I love how the style of this sweater gives off a vintage feel without being over-the-top. I seriously have to stop myself from wearing this three or four times a week. Unbuttoned, it works like a jacket, and has a more casual air. Buttoned over a dress, it adds definition to the waistline and emphasizes a full skirt. I wear this cardigan year-round; the ivory color still feels appropriate even in darkest winter. And it's so lightweight that it's perfect to throw on over a summery dress in even the hottest weather (especially since my office is an ice chamber). I love the little details (the buttons, the shawl collar, the dolman sleeves) that make it feel like a special garment. I have a ton of cardigans and so often when I put them on, they seem to bring down an outfit. They look dowdy or just ... boring. This one never disappoints. OK, have I freaked you out with how much I seriously love this sweater? The really amazing thing is that I haven't ruined it by spilling food on it yet. For real, I get stains on my clothes so often it's not even funny. Anyway, you can expect to see plenty more of this little gem in future posts, but I have pledged to wear it a maximum of once a week so that it's not overkill. Do you have a favorite garment? Join in the linkup and show it off! I recognize this cardigan ;-) Now that you've gone over its flattering features, I want an equivalent one! This is indeed a very flatter cardigan to you and I like the "has a retro flare without being fussy."